If you’ve noticed I’ve been keeping things pretty simple and wearing a lot of basics (and repeat offenders) lately, you’d be right. I have so many new pieces I’m excited to share with you, but wanted to wait until I was in Japan to shoot them! So I’ve been making do with some old favorites and a few new neutrals the last couple of weeks. Hope y’all are okay with that! Today I thought we’d cover a wardrobe staple that we ALL like: the white tee. There aren’t many things more versatile than a clean white tee. Need some examples? You get the gist. They just work. Now the trick is finding a few key styles to have on hand for all the above situations and more. If you’re on the hunt for some chic white tees for spring and summer, don’t miss this roundup below. I kept price in mind for most of these finds, but did throw in a few investments! 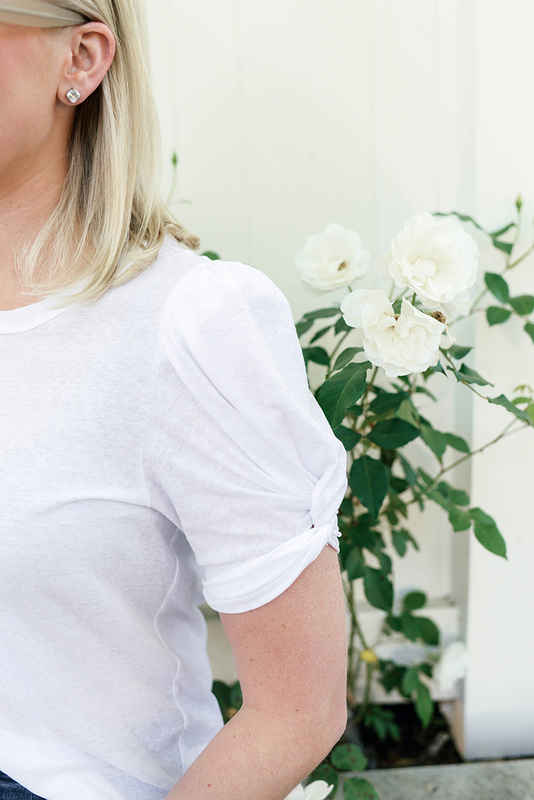 I usually prefer linen tees to cotton, and this one looks like it may be my newest target. I have another linen style from the GAP a few years ago, and still wear it a lot! There are two tee necklines I think all women should own, and one of those is the crewneck. This crewneck tee is $20, looks like a great fit and is as effortless as it gets. This $25 tee looks just like my favorite tees from THE GREAT (which are much more expensive). This tee is the one I’m wearing in this post. Yes, it’s a splurge… but the pretty twist-sleeve detail elevates it to statement staple status, which makes it a completely worthy investment in my book. It’s a piece so simple you can wear it with any of the items I mentioned above, but features a cool detail that makes it special. So cute! The other neckline I think all women should own is a classic v-neck. This tee does it well and is under $20! With the open back style of this tee it’s not exactly great for the office, but would be cute with shorts this summer on the weekends! It’s also under $30. This Topshop tee is only $10 and perfectly cropped for summer wear. Loving the back hem length on this Rag & Bone tee! I’m also tempted to try this linen tee from H&M. The price is just too good! H&M also has a really great basic crewneck for only $12.99. Yes, please! I can almost feel the softness of this Vince tee through the screen. I’m pretty sure I could live in a piece like that. This tee is only $25 and features a fun twist detail and opening in the back. Great for hot, hot summers! If you enjoy a good twist look, check out this style by 7 for All Mankind. I love a good white tee! The sleeves on yours is so cute! I love those sleeves so much! And BTW, your purse is super cute! That shape is so fun! Love your basics roundups. I LIVE in black tees and I’m always on the hunt for new styles and sources, so this is steering me in the right direction. Thanks! Lovely basics dear. Indeed, you can’t go wrong with such classic. Lovely tips!